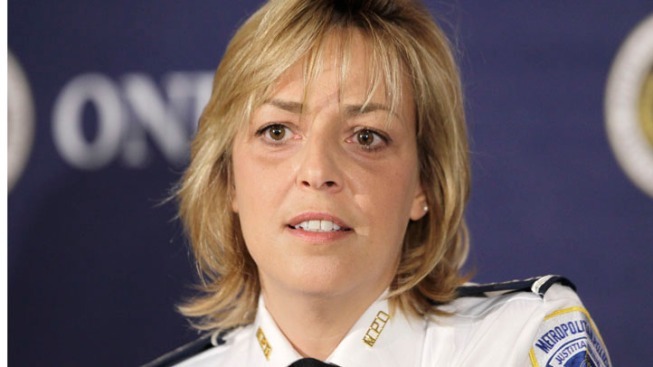 D.C. Police Chief Cathy Lanier made a rare courtroom appearance Tuesday, testifying in a federal lawsuit stemming from mass arrests of protesters who were corralled in a city park during a 2002 demonstration. Lanier's hour-long testimony came as a federal magistrate continues to investigate allegations of potential evidence tampering in the case. The lawsuit concerns the arrests of about 400 protesters outside the September 2002 meetings of the International Monetary Fund and World Bank. Though the D.C. government already reached a collective multi-million-dollar settlement with most of the plaintiffs, a few remain in U.S. District Court in Washington. The testimony Tuesday centered on a contractor's sudden discovery in May 2011 of electronic police logs tied to the case that were previously presumed missing. The contractor told police at the time that it appeared someone had tried to delete the data, though lawyers for the D.C. government have said those comments were misunderstood. The recovery of the data prompted the department's general counsel, Terry Ryan, to contact the head of internal affairs to request an investigation into possible evidence tampering. Lanier, under questioning from U.S. Magistrate Judge John Facciola, recalled being told that data from the server had been recovered by the contractor but said she did not remember being told that anyone had actively tried to delete anything. The chief testified that she specifically told Ryan that any investigation into the data, or analysis of what could be recovered, should not be done by the police department since it didn't have a computer forensics unit. She said she wanted it handled by an outside agency like the FBI. The Secret Service and FBI came to police headquarters, and the Secret Service ultimately imaged the hard drives. “Anything that's done in terms of an analysis would probably be safer if done by an outside entity. I didn't want (the Metropolitan Police Department) to be involved,” Lanier said. That testimony was significant because Ryan has said he doesn't recall Lanier giving such a directive. And attorneys for the city have said they were under the impression that the department's internal affairs division was conducting its own investigation when, in fact, no such investigation was ever authorized or occurred, Lanier said. Lanier also acknowledged that she did not discuss how Facciola, who is serving as special master in the case, would be made aware of the suddenly recovered evidence even though such evidence had been sought for years. She said no one told her that someone had actively hit the ``delete'' button, but that she would have been concerned about any possible criminal evidence tampering.